DSA sees sense on steering… but have Instructors? After much recent pressure from within the professional driver coaching industry, the DSA have made an important amendment to their driving test marking guidelines. It seems to be a little known fact that a driver taking their driving test will not be faulted for simply failing to adopt the ‘pull-push’ steering technique. In truth, this has been the case for over 20 years, but the ‘pull-push’ method has become so ingrained within the industry that many driving instructors still vehemently insist on its use. A new paragraph has appeared in the latest amendments to the DT1 (DSA Examiners Guidance Notes) with regard to ‘control’. You can access the full document here. Driver coaches are delighted that this important steering issue has been clarified, not because the pull-push technique is incorrect or dangerous, but because it opens the door for the introduction of coaching as a primary training method in driver training. It seems that up to now many examiners and perhaps the majority of driving instructors have not got the message. But at long last, this small amendment to the DT1 should help clarify the issue. This has personally been welcomed by myself, who has had first-hand experience of ADI Part 3 examiners marking PDI’s down for not advocating use of the pull-push method during their instructional examination. The main reason instructors give for insisting on the use of the pull-push technique is because of the increased risk of arm or facial injury due to the deployment of the airbag during a crash. Indeed, I myself have perpetuated this belief over the years. However, it has emerged that there are no factual studies to back up this claim – simply hearsay and quotes from unverifiable sources. In any case, it is likely that the driver will cross their hands anyway, just before the point of impact, in an attempt to avoid the collision. And what is one of the first things most new drivers do after passing their driving test? They leave the pull-push method behind and begin to steer ‘naturally’. Drivers do not crash because of how they steer – they have crashes because of the way they plan (or fail to plan) their driving. The ethos of driver coaching is that the learner is allowed to develop their own safe driving style, to become more aware and responsible drivers. Insisting on an un-natural steering technique undermines this principle. “So where do we go from here” I hear you ask? Simple – allow your pupil to steer in the way that is most comfortable for them. I’m not suggesting that you dismiss the pull-push technique – it is simply one of the methods for turning the wheel. 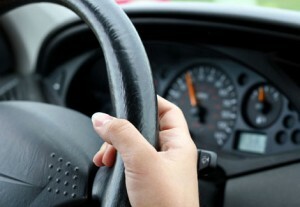 As long as the driver maintains safe control over the steering of the vehicle at all times, they can adopt whichever steering technique with which they feel most comfortable. Remember here that the only part of steering methodology to which I am referring is in the way the wheel is physically turned. It is still safer to hold the wheel in the conventional “ten-to-two” or “quarter-to-three” position, just as it is still safer to drive with both hands on the wheel. But if we are to eliminate the damaging public belief that “you drive one way to pass your test, and another way when you’re on your own”, driving instructors need to ‘get real’ and begin to instil a true level of awareness and responsibility from the very first lesson. I could not agree more. Steering is a natural sense that everyone develops to a degree of control that is usually sufficient. You can push the wheel (a method used by some race drivers), or reposition both hands to turn the wheel (again, a racing method, less practical on the road), or you can pull the wheel, in one flowing movement, just enough to get the car to turn, and to stay with each hand on each side of the wheel, in the center (9 to-3) ready for applying more (or less) steering mid-corner. The point I was trying to convey was that whilst the industry widely believed that pull-push was a necessity, it undermined the coaching philosophy of allowing a driver to develop (in this case) their own comfortable, safe steering technique. If one was to coach people in safe and comfortable steering methods, it is unlikely they would naturally adopt a pull-push technique. Instead, the pull-push technique needs to be demonstrated and taught – which obviously ISN’T coaching. This written confimation by the DSA now lends support to driver coaching, as the prescriptive pull-push technique is no longer seen as a necessity. I hope that clarifies my comment. Where can I learn more about driver coaching as a training method? You write that ‘there are no factual studies to back up [the] claim [that there is an] increased risk of arm or facial injury due to the deployment of the airbag during a crash,’ but I would argue that this is not the case. Here in the USA, ‘hand-over’ steering (i.e. crossing the arms) is the only method taught to student drivers (i.e. learners). A few years ago, the US DOT published the fact that there had been an increase of around 450 percent in the number of serious arm and facial injuries since the advent of drivers’ air bags. That was an official statement, and I would argue that a very significant proportion of this huge increase was, in fact, directly related to the failure to teach/use pull-push steering. Indeed, it is now commonly taught in the USA that the wheel should always be held at the ‘twenty-to-four’ position (a.k.a. ‘eight-and-four’) ‘so that one’s arms are not hurt WHEN the airbag goes off’. And I’m not exaggerating about the “when,” either! Well, Eddie whilst I agree with the 8-4 position, it is almost unheard of an airbag going off spontaneously here in GB. Indeed, if you are going to hit a large solid object I would suggest the last thing, instinctively, you do before you hit it is to cover your eyes with your hand. The deployed airbag will certainly press the back of the hand into the face. How’s Tom & Ray these days? I would be curios as to your thoughts?